Congratulations to Samantha Doyle, the St. Tammany Credit Union’s Exemplary Teacher of the Month! Recently our own Mr. Daniel Scheer won the WSTE mini-grant for the fourth year in a row. He plans to use the funds to purchase five Space Rail Roller Coaster model sets for students to build and use during their studies of kinetic and potential energy along with the law of conservation of energy. Previously this school year, Mr. Scheer won an LSU QSM grant which will provide his physics classes with a DJI quadcopter drone allowing students to utilize cutting edge technology while investigating classical mechanics, and the physics of flight. Coach Boudreaux attended a sea glider workshop on February 11th at UNO where he learned about sea gliders and built one of his own. He hopes to eventually build them in his environmental science class. Sea gliders are used in the ocean to help track mammals. CHS is proud to announce that James Inman and Daniel Scheer teamed up this year to secure one of nine WST grants out of over 40 entries. The funds will be used in a cross-curriculum project allowing students to become Virtual Travelers to exciting places around the world using 15 Virtual Reality Headset Goggles. This technology will allow geography students to view 360 degree views of places like Washington DC, Paris and Dubai in both still photo and video forms. Science students will be able to visit places like MIT’s fusion reactor, Googles Server Centers and Iceland’s Underground Seed Bank. A set of 360 degrees cameras will also allow science students to film their own school lab activities in a way never imagined before. These are exciting times at Covington High School. Theatre teacher Gary Mendoza has been selected as St. Tammany Parish's "Performing Artist of the Year!" Gary Mendoza said he became hooked on theater while a student at Pearl River High. He earned a bachelor's at Southeastern Louisiana University and a master's at the University of New Orleans. Mendoza has performed onstage at Tulane, Skyfire and Cutting Edge theaters, and has won several Ginny Awards at Slidell Little Theatre. He is co-artistic director of the Covington Louisiana Actor’s Playhouse System, a summer theater program for high school students that just celebrated its 21st season. Mendoza has been the theater teacher at Covington High School since 2005, and many of his students have gone on to win awards in competitions that range from the National Shakespeare Competition to the Poetry Out Loud National Recitation Competition. He recently was awarded a fellowship to study for three weeks at Shakespeare’s Globe Theatre in London as part of its Teaching Shakespeare Through Performance program. He along with other winners was honored on January 28th at the St. Tammany Justice Center. Congrats to Mr. Gary Mendoza who was awarded an ESU BUSS (British University Summer School) scholarship to participate in an intensive program working with professionals at the Globe Theatre. Recently WST Electric revealed the winners of their 2016 mini-grants. Of the 11 recipients, five were teachers from St Tammany Parish Schools including our own Mr. Scheer who has won two years in a row. This year’s award will fund a “laser communicator” project for our senior Physics classes. They will be constructing a device that will encode a music signal onto a laser beam shot across the room where a receiver will turn it back into sound. See a video about our current 2015 Teacher of the Year, Coach Jimmy Inman! Tom Cruise, who is in New Orleans filming a movie, swung by the Saenger Theater to catch a production of "Newsies". He came backstage after the show to congratulate the orchestra & cast on a job well done. Pictured below is CHS Talented Music teacher Mel Rogers with Mr. Cruise. Four CHS teachers recently attended a NEED Energy Workshop. The workshop was sponsored by Shell and introduced teachers to the scientific concepts of energy production and energy use. Mr. Turner, Coach Boudreaux, Mr. Scheer and Mrs. Wager will each receive a comprehensive package, to be shipped later, of at least 6 classroom activities with assorted materials including solar panels, electric motors and mini-digital scale. Just one more way CHS shows its Purpose, Passion, and Pride! St Tammany Parish teachers were well represented at Jazz Fest last weekend as (I to r) Mel Rogers, Tim Schneider (principal at Fontainebleau Jr Hg), & Lee Hicks (director of bands at Fontainebleau High) were tapped to play in the orchestra backing up Tony Bennett and Lady Gaga. The 90 minute concert, held in front of approximately 20,000 people, consisted of songs from the Swing era made famous by Bennett throughout his 60-plus year career. Clips of the concert can be viewed on youtube. 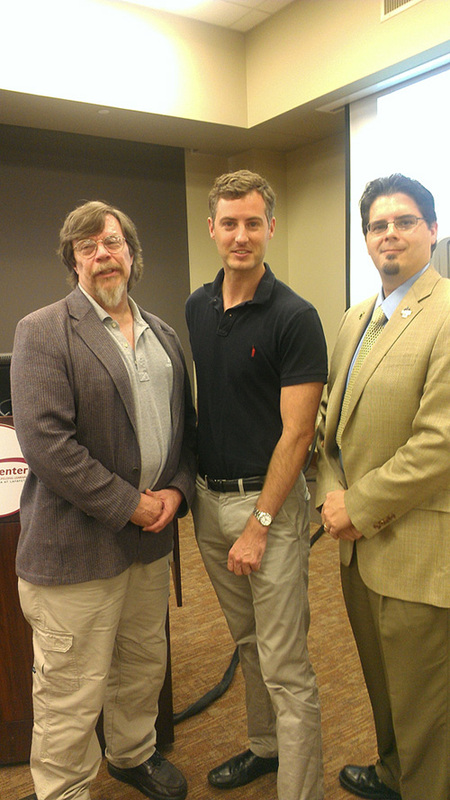 Physics teacher Mr. Daniel Scheer won the West St. Tammany Electric Cooperative 2015 mini-grant! His proposal allows the purchase of a Van der Graaf generator along with various materials to engage students in the study of electricity. Covington High Talented Music teacher Mel Rogers, aka Phantom of the Saenger, getting ready for a performance of Andrew Lloyd Webber's "Phantom of the Opera". The mega-hit musical, which has been touring the US for 20 years, is currently camped at the Saenger Theater in New Orleans. Mr. Rogers is part of the 15-piece pit orchestra made up of mostly local and some travelling musicians. Talented music teacher Mel Rogers has been invited to perform with the Mobile Symphony Orchestra for their opening concert next weekend. He will be performing George Gershwin's "An American In Paris" which is one of the few orchestral works to feature a saxophone section. Business department teachers Jennifer Hudmon and Vance Lynch applied for and received approximately $32,000 worth of new equipment from the Northshore Technical Community College, to be used in their classes this year! Jennifer Hudmon is getting 33 brand new computers strong enough to handle a lot of the photo editing and other graphics-intensive Paw Prints projects. Her IBCA students will also have access to these fast, new computers for their assignments. Vance Lynch acquired a new DSLR camera, two powerful lenses, and a DVD duplicator with his portion of the funds. The equipment will go towards the promotion of all school activities such as sports events, music/theatre productions, and general classroom activities. His students immediately began using the new camera equipment, and you can view the improved quality by looking at any of this season's basketball and soccer photos, among others. Mr. Kenneth Byrd's class collected $551.00 for the Leukemia and Lymphoma Society. Technology teacher Vance Lynch received his National Board Certification on November 17th, giving Covington High eight National Board Certified teachers and counselors. In addition, this past November Lynch received LACUE's Region II High School Teacher of the Year award. Belinda Pennison was the coordinator for our United Way fundraiser and the school collected $3,738.68 this year, with Mr. Kenny Byrd's 1st hour class leading the way with $175.00! Covington High teachers John Thacker and Vance Lynch recently attended the first Teacher Advisory Committee meeting for the state's Louisiana Believes initiative. They met with state superintendent John White to discuss ways to enable teachers to enhance student performance across the state. The next meeting is scheduled for December. 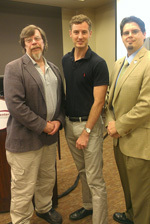 Computer technology teacher Vance Lynch and science teacher John Thacker were both selected to serve on the Teacher Advisory Committee of the state's education reform initiative, Louisiana Believes. Lynch and Thacker will meet with other teachers and state education superintendent John White four times over the school year to discuss reforms that prepare more Louisiana students for college and professional careers.